Get ready to tackle uneven terrain and big jobs with the vibratory roller attachment. Designed for greater operator comfort, the isolation mounting system reduces vibration transferred to the operator, meaning less operator fatigue and more comfortable working conditions and a more packed jobsite. It is the ideal attachment for site preparation operations, landscaping contractors, and paving operations. Easy to haul over the road, the vibratory roller is an agile jobsite attachment, delivering faster results in fewer passes. Sand, pea rock, gravel, and asphalt patching: Choose a smooth drum. Heavy soils, clay, and clay-based backfill compaction: Choose a padded drum. The vibrating action of the roller allows the base material to realign and compact from the bottom up. A hydraulic motor drives a centrifugal weight on the drum shaft that provides the compacting action. Bi-Directional Operation: Dual-direction vibration motor permits compaction while traveling in either direction. Drum Oscillation: Free drum oscillation keeps more of the drum in contact with the surface on uneven terrain. Isolation Mounting System: Reduces vibration transferred to theoperator, meaning less operator fatigue and more comfortable working conditions. Also, affords more consistent pressure to the ground, delivering constant compacting results. Offset Drum Design: Allows the right side of roller to extend past the machine for compacting next to sidewalks, walls, or curbs. Oil-Bath Bearings: Designed to avoid costly downtime, the oil-bath bearings eliminate the need for daily greasing. Protected Hose Routing: Maximizes uptime and keeps couplers clean. 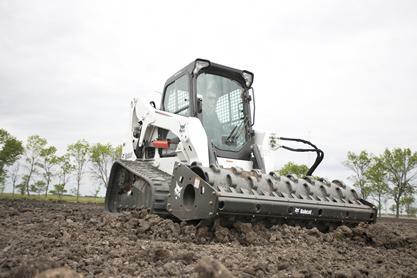 Scrapers: Keep the drum clean for better ground contact and compaction. Versatility: Depending the jobsite, choose between a smooth or padded drum. Bob-Tach® Mounting System: Turns any loader into a multi-job machine with a tight-fit attachment hook-up. Fast and easy attachment changes means spending less time on maintenance and more time on the job.